The Up Up and Away Greetings Creative Card Kit includes everything you'll need to create the 6 cards and 2 tags shown. This month i've focused on an adorable art with a hot air balloon theme. There are a variety sentiments to choose for your cards and the cards have matching sentiments for inside the cards. Envelopes and full color copies included. other back then. Fast forward 20 something years and 35 miles south of our elementary school and our kids end up in elementary school together. We’ve been creating together ever since. I love her like the sister I never had. Her energy and spirit are contagious. She’s an amazing artist and it’s been a real joy to watch her grow as an artist over the last several years. I created this months cards kits "Heartfelt Greetings" with Stephanie’s stamps, and die-cuts and fonts. Heck she even hand cut hearts for each of you! She hand cut an alphabet for me and I scanned it to create a few of the sentiments. Steph is creating a buzz , encouraging everyone to create art from art. That’s what I did… she created art, I made art from that art and now you have a chance to make art from that art. It’s a big creative circle of heartfelt goodness! In this kit you'll receive supplies to make 6 A2 size cards, 3 mini cards and 2 tags, hand cut hearts by Stephanie :), an artist profile sharing my thoughts about my pal, full color copies, envelopes, and darling mini glassine bags for the mini cards). Whew, you're going to love it. As always 95% of my kits parts and pieces are all cut to size. This makes for easy assembly and relaxing creative time. 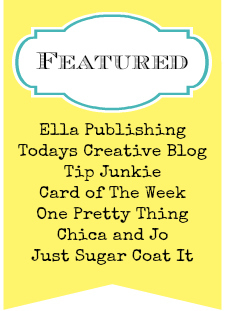 I hope you'll treat yourself to a kit and complete the heartfelt circle of creativity! You can purchase the Heartfelt Greetings Kit HERE in my shop. This month there are matching inserts for all the cards. and check it out at HERE Make sure you grab a drink and clear your schedule, you’re going to be there awhile. can take online classes too! She currently has an amazing class "A Whole New Doodle". And while you’re on her blog sign up for her newsletter, follow her on Facebook and Pinterest… I have some insider information and my friend Steph has big big things coming up! Thanks for your time today, I hope you have a beautiful weekend! Happy Friday! Compliments to my good friend Rachael Bright for help with these amazing graphics,as well as the black chalkboard kits from June. Rachael is an artist at Sizzix and creates some beautiful die designs. You can check out more of Rachaels work HERE. And Rachaels latest release Shabby Chic is an all time favorite of mine. Thanks Rachael for all your help! 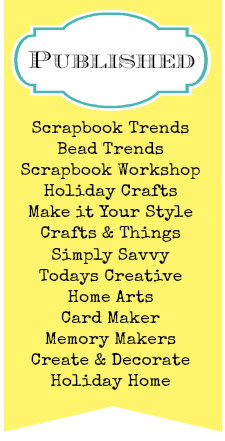 This is the last weekend to shop my Kit and Crafty Goodies sale. See all the items on special in the shop HERE. I was planning to unplug for a few days and do some fun summer stuff. So, I pre wrote a bunch of blog posts and then never made them go live. Funny, I don't think this is the first time i've done this. I'm so in love with this chevron paper. My favorite colors right now and the scale is perfect! These two cards are from my July Creative Cards Kit, there are still a few more left in the shop as the month comes to an end. Today I'd like to introduce you to my very good friend Eileen Hull. Eileen and I work together for Sizzix and she designs an amazing line of dies called Scoreboard dies. Most of her dies are meant to be cut from mat board which makes the die cuts rigid. You can cut chipboard or matboard. The ScoreBoards dies produce sturdier boxes, pockets, holders and other ultra-versatile designs. But what's even more cool is the versatility... these dies can cut cardstock or patterned paper alone and that's just what I did for my July cards in the Vintage Greetings Kit. As I was saying...Eileen is just about the sweetest person i've ever met in the craft world or otherwise. Her warm and kind personality just make me smile every time I have the pleasure of being with her. Hands down my favorite die Eileen has ever designed is this Canning Jar die. I've created the two cards shown here with it. Mason jars are so hot and trendy right now, and I adore them. You can see all of Eileen's Dies HERE and you can visit Eileen's Blog HERE. Just take a few peeks at her videos and you'll see what I mean, she's just charming! 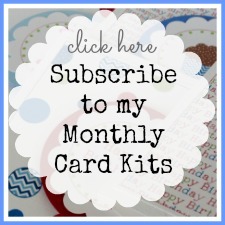 Hope you'll try one of my kits out and you can even subscribe to receive new card kits every month. Connect with Eileen on Facebook, Connect with me on Facebook, check out my technique video to coordinate with this months kit, and the Vintage Greetings July Kit. Hope your day is off to a wonderful start!